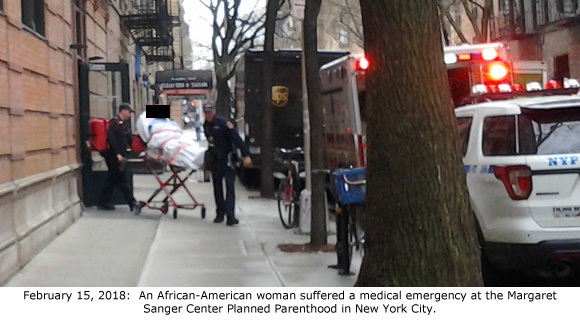 New York City, NY – An African-American woman was transported by ambulance from the Margaret Sanger Center Planned Parenthood abortion facility on February 15, 2018. 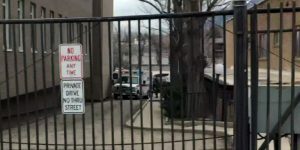 This is the tenth medical emergency documented by Operation Rescue with the help of local pro-life activists at this facility since January 2017. 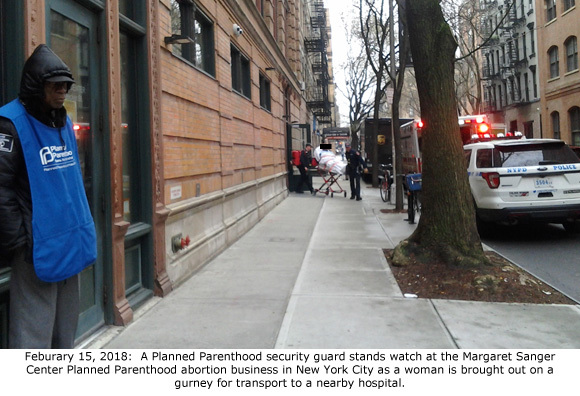 Planned Parenthood’s flagship abortion facility, the Margaret Sanger Center is located in a high-rise brick building at 26 Bleecker Street on Margaret Sanger Square in New York City. 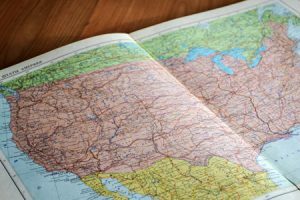 Planned Parenthood is known to target the neighborhoods of poor, urban women of color, and the Margaret Sanger Center Planned Parenthood is an example of that. 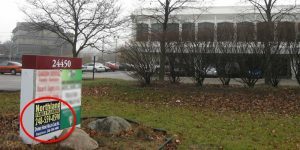 A witness told Operation Rescue that an ambulance, police cruiser, and a fire truck responded to the medical emergency. 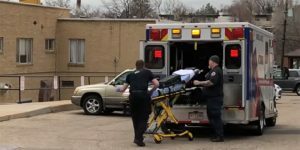 The ambulance arrived at Planned Parenthood first at approximately 10:44 a.m. She described how the sirens were not used within a block of the abortion facility. 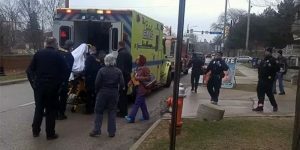 Photos of the incident showed an African-American woman covered up to her neck with sheets as she was rushed from the building to the ambulance. Gurney access to the actual abortion offices is problematic. 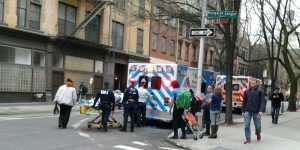 Women are generally brought down to the lobby in a wheelchair where they are transferred to a gurney. 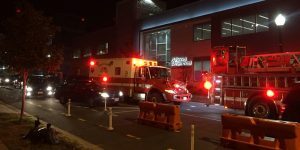 The condition of the hospitalized woman remains unknown at this time. 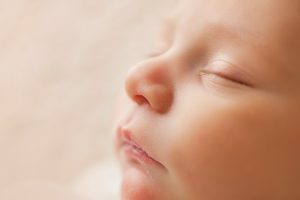 At one time the mantra of the pro-abort politicians was that abortion should be “legal, safe, and rare.” They backed off on “rare” a long time ago. Now they’re backing off on “safe”. If, as the Left claims, abortion simply involves removing a little clump of cells, then why call for it to be rare? Why worry about whether they’re rare or as common for your average woman as a visit to the hair salon? Planned Parenthood’s money first, their victims, good luck !!!!!! 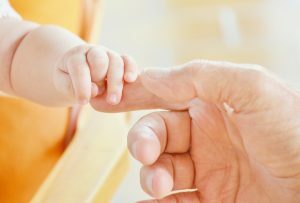 SHUT DOWN THESE KILLER PLACES FOR BOTH BABY AND THE MOTHER. THEY ARE DROPPING THE POPULATION OF THE BLACK PEOPLE AND YOUNG TEENAGERS.!!!!!!!!!! 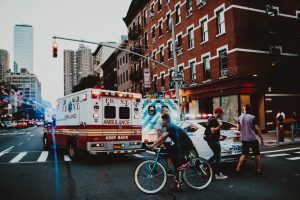 Whites are dying too from botched abortions. We just don’t hear as much about them because it doesn’t fit in with the racial incitement narrative. Statistically, there are more black women getting abortions that white women. And PP has offices in the black communities because of this. Know however, that there are blacks employed at PP too. Forget Sanger – she’s long dead. It’s not much about race anymore. The long term problem with the Planned Parenthood murderers is that many of these poor young women are left without the ability to ever give birth to a child. I have to wonder – do the hospitals that these victims are taken to have any mandated reporting protocol. In other words, does the department of health and human services have any record of these admissions? If so, then the whole medical community is involved in the crimes inflicted on these young women and their babies. If not, why not? Hi John. You know, I never thought of that, but you make an excellent point. I don’t see how the Dept. of Health and Human Services could NOT have records of abortion-related admissions. I would like to know, too. “Safe, rare, and legal”….guess which word of (Bill) Clinton’s infamous statement is true…. Mrs Sanger would be so proud to know that her anti-blacks, eugenics philosophy is still going strong after all these generations have passed. How sad that this woman is African American. It reinforces what Sanger preached so long ago. This is a prime example of the dangers of abortions, especially late-term abortions. Why are we protecting these demons? I call them out in the Name of Jesus Christ Who stands for life for the unborn. We do not treat unborn puppies this way! Probably a late term abortion. I pray they get sued and perhaps save a few lives of babies! Guns are the death of children in schools and the media is all about that for a week or so and no gun rallys are many……BUT there are hundreds more children dying from surgical knives and the media is quiet!!!! Should we protest the use of surgical knives or the owning of such? !